I was a bit disappointed in the Sandford market today. After taking a 11 different varieties of seed potatoes and making a lovely display there was no interest in them. I know, I know... "What? grow my own vegetables? It is much more fun using my backyard to store rusty, old, broken down cars"
Anyway, I am still having trouble also with the Vivid choi for some reason. Usually people love the coloured veg but no-one gives this beautiful vegetable a second glance. I am going to have to think of a new marketing angle to get people attracted to it. When I got home I did some watering and decided to take a couple of pictures of this kohlrabi plant that has a giant fasciated stem. 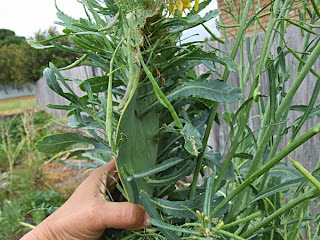 Fasciation (or cresting) is a relatively rare condition of abnormal growth in vascular plants in which the apical meristem (growing tip), that normally is concentrated around a single point and produces approximately cylindrical tissue, instead becomes elongated perpendicularly to the direction of growth, thus producing flattened, ribbon-like, crested, or elaborately contorted tissue.Fasciation can also cause plant parts to increase in weight and volume in some instances. The phenomenon may occur in the stem, root, fruit, or flower head. 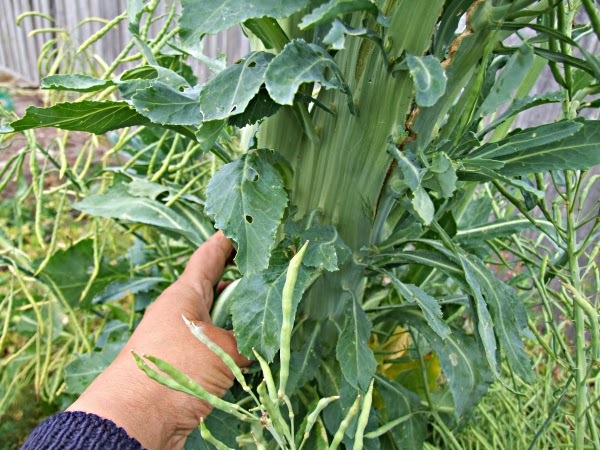 Some plants are grown and prized aesthetically for their development of fasciation. I find it puzzling as to why each year it is a different vegetable that this phenomenon shows up in, a couple of years ago many of the melons showed varying degrees of fasciation, I can't remember what plant it was last year. There are many theories as to what causes it but no-one knows for sure. Most scientists think it can be caused by a number of stresses on the plants, but that doesn't explain why it only affects one or two individual plants at any one time. They say it can be caused by anything from water stress to viruses to hormone problems. In any case it is not usually anything to be worried about. Some plants like some cacti are encouraged to form fasciation (it is hereditary in these varieties) which accounts for their fantastic forms. Some years you see it everywhere on different plants but this year I have only spotted this one. 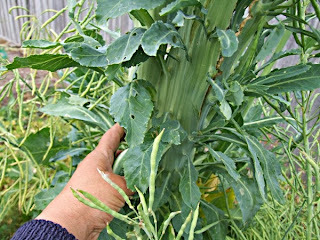 The stem is huge and much taller than the surrounding plants. I have decided that I can't bear to waste all the oca and other plants in pots that I was going to discard so I will plant a couple more beds that I have recently harvested seeds from. I have more space than last year so I can spare a bit of it. I only hope I can easily sell the tubers when they are harvested, I will have heaps. I will do that tomorrow since the weather is supposed to be cool.